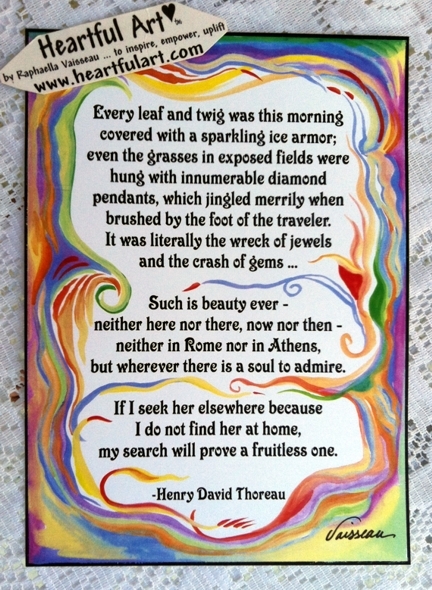 "Every leaf and twig" is a 5x7 poster print of wise words from Henry David Thoreau, with art by Raphaella Vaisseau. A less well-know quote from the beloved transcendentalist it is one of my personal favorites. This quote is for everyone, but especially people who love nature and who are also seekers, devoted to aligning themselves with the best and highest expression of the gift of life and the world we live in. An inspirational, high-quality poster, this is a treasured present for people who love nature and life itself (including yourself). It can be framed, displayed on an easel, or mailed as a gift. Look within. Appreciate the beauty that surrounds you. Be accountable and be present in the moment you're in. Magic awaits.